Jennifer Windom is a trial attorney with a broad practice focusing on complex civil litigation, government investigations, and enforcement actions. She has litigated in federal and state courts, and represented clients in matters before the Civil and Criminal Divisions of the Department of Justice, the Securities and Exchange Commission, the Public Company Accounting Oversight Board, and various other government agencies and Congressional committees. 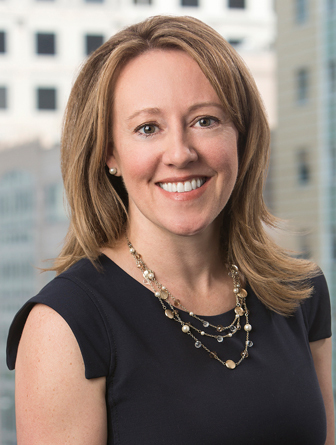 Jennifer routinely represents clients in the highly-regulated areas of health care, federal contracting, public accounting, and banking, and often manages matters presenting civil, criminal, and regulatory risks. She also regularly conducts internal investigations and advises clients on compliance best practices. Her clients have included publicly-traded companies, major financial institutions, accounting firms, hedge funds, individuals, and trade associations. Before joining Robbins Russell, Jennifer was an attorney at Latham & Watkins, LLP, and served as a law clerk to the Honorable David F. Hamilton of the United States District Court for the Southern District of Indiana. Before law school, Jennifer worked for a major consulting firm, designing and developing information systems for the country’s largest telecommunications companies. Represented Fortune 500 health care company in consolidated federal qui tam multi-district litigation and related government investigations involving allegations under the False Claims Act, Anti-Kickback Statute, Stark law, and related state statutes. Represented publicly-traded health care companies in various DOJ and HHS OIG investigations concerning billing practices, physician arrangements, and other payment issues. In every instance, the government declined to pursue charges or seek penalties of any kind. Represented major accounting firms and individual auditors in all stages of SEC and PCAOB investigations and enforcement actions. Represented publicly-traded entertainment company in various lawsuits, including participating in seven-week jury trial and related appeal proceedings, concerning company’s entry into foreign gaming market. Represented major defense contractor in successful bid protest at agency level and successfully defended appeal to federal court. Represented same client in multiple internal investigations evaluating potential fraud and retaliation claims under the False Claims Act. Represented publicly-traded online travel company in federal trial concerning tax treatment of pre-IPO stock awards to company founders. Represented energy trade association in litigation in the D.C. Circuit concerning an EPA rulemaking regulating carbon emissions. Represented bank employee in connection with DOJ, Treasury FINCEN, and state investigation into bank’s AML and compliance practices. Represented high-profile individual in connection with DOJ bank fraud investigation. Represented senior executive in investigation relating to alleged unapproved testing and marketing by medical device manufacturer under the Food, Drug, and Cosmetic Act. Represented senior automotive executives in connection with DOJ, SEC, and NHTSA investigations relating to their employers. Defended major financial institution in multiple lawsuits relating to commercial mortgage loan securitizations. Represented Audit Committee of Fortune 250 multi-national corporation in government investigation into potential violations of Foreign Corrupt Practices Act. Led negotiations with House Committee on Oversight & Government Reform on behalf of major accounting firm in connection with Congressional investigation into federally-funded program. Represented pro bono a university student facing multiple felony charges relating to Constitutionally protected protest activity, resulting in government’s dismissal of all charges.